Finals are now out of the way and so my busy period is almost over. After that, I’ll be able to do a couple posts I’ve been meaning to put up for a long time. So this week sees another creature feature about an animal you may have heard of. That animal’s name is Abydosaurus. You probably know him from a flurry of news reports back in March. Abydosaurus is just another of the new dinosaurs coming out of Utah’s cretaceous rocks, in this case the Cedar Mountain Formation. Interestingly, Abydosaurus was found in an outcrop at Dinosaur National Monument near the old visitor center. With any luck, he’ll show up in the new visitor center! Why? Because Abydosaurus stands out among sauropods. Not because it’s a new species (those pop up all the time), not because of its size (it’s only 25 feet long, though the individuals recovered are juveniles), and it’s not because of its time or relationships (early cretaceous brachiosaurid. I love brachiosaurids!). What makes Abydosaurus unique is that the quarry where the 4 individuals were found yield a complete skull. What is more, it also produced the remains of 3 additional skulls! This is unheard of in sauropods. Their skulls are so small and delicate that they mostly don’t survive fossilization. Paleontologists are ecstatic when they find a sauropod skull. To find 4 is simply unheard of. This gives us an unprecedented look into the biology of this animal. Skulls are the part of the body that reveals the most about an animal: what it ate, how strong its senses were, the structure of its brain, balance, and possibly even mating habits. And because skulls carry such a suite of features they are very important in classifying animals. The skulls of Abydosaurus upfront showed that it was a brachiosaurid, a group of sauropods who resembled reptilian giraffes. The skulls showed that this animal had wider teeth than other brachiosaurids. The skull is very similar to Africa’s Giraffatitan even though the Abydosaurus , with its age of 104 mya, lived 45 million years after the famous Jurassic giant (who was once known as Brachiosaurus brancai). The name of Abydosaurus stems from an uncommon source of animals names: Egyptian mythology. I used to be a nut on Egypt back when we studied it in 6th grade. Abydos is the Greek name of a temple that rests on the Nile. According to Egyptian mythology, Abydos is the resting place of the head and neck of Osiris, the lord of the Egyptian Underworld. Seeing as the holoytpe of Abydosaurus consisted of the head and upper neck, and the site overlooked the Green River, the named seemed to apply. In my opinion, an extinct animal needs to be named (whether it’s a nickname or a scientific name) after a mythological figure with one of the coolest names out there: the Greek hero Belerophon. 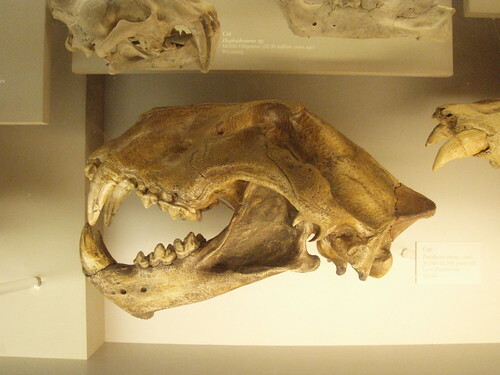 There is a group of carnivores i often refer to as the “Big 4” of the Ice age, mainly for their prominence in discussions of the Pleistocene: Smilodon, dire wolf, Arctodus, and the American lion. That last one, it seems, is in the midst of having it’s identity changed. The American lion was discovered in 1853. Joseph Leidy, one of the leading paleontologists of the time, named the animal from a jawbone brought to him from Mississippi. Since then many more fossils of the big cat have been found from Alaska to Mexico and from coast to coast. The best remains come from the famous La Brea Tar Pits in California. So far over 80 individuals have been pulled from the black ooze, allowing a more complete picture of this animal. But it’s remains don’t extend to just bones. Enormous footprints from a cave in Missouri have been attributed to the American lion. What is more, a mummified bison carcass from Alaska was found with deep scratches on its back, bite marks across its muzzle, and a fragment of tooth in its hide, all testifying to this cat’s killing power. But while it is often hailed as the biggest cat ever (some estimates exceed 700 pounds) it’s identity has always been a bit of a puzzle. It was long thought to be it’s own species, Panthera atrox; Panthera is the same genus in which lions, tigers, leopards, and jaguars belong. In recent times it was placed within the modern lion species as Panthera leo atrox. This made it the American subspecies of lion with the African lion as it’s closest relative. There have even been some suggestions that it wasn’t a lion but an American tiger! However a recent study has cast doubt on this classification. Danish zoologist Per Christiansen and American paleontologist John Harris have done a study comparing the American lion to other big cats. They compared 23 skull dimensions of the American lion with other big cats and found something unusual. While it shared many features with lions it also had many features not seen in lions. Further more, it had features not shared with any big cats. But many features, like the lower jaw, linked it with the jaguar. So instead of being an American lion, it appears the Pleistocene of North America was home to a giant form of jaguar. 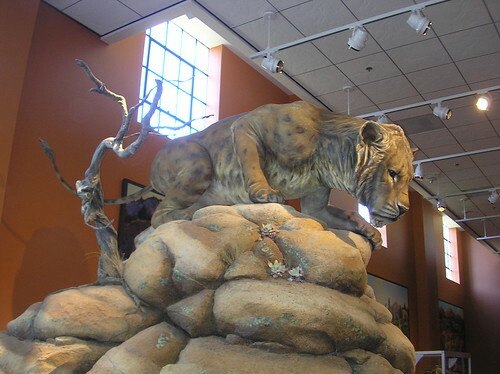 The authors of the study suggest that the American “lion” may have descended from a group of pantherines that came to the New World in the mid Pleistocene (this group may also have spawned jaguars). So what does this mean for the American “lion”? It is interesting that it is like a giant jaguar, since jaguars were known to have roamed Pleistocene North America. It may be that jaguars stuck to more forested areas while their larger cousins preferred open habitat. I feel though that the name lion will remain. It’s been in use for a very long time and has a sense of power and strength to it. It may be that as with many other prehistoric animals, the name of the beast will have to be explained to future generations as a slight misnomer.